You don’t have a clue what’s going on in the news. Not a clue! There’s no time to catch up on current affairs when you’re in bed by 8pm every night and unable to concentrate on anything, except the baby, when you’re awake. The realisation hit home for me when I discovered Margaret Thatcher had died – about three months after she actually did. Turns out I was too knee-deep in nappies and nocturnal happenings to clock it on the news or in the papers. 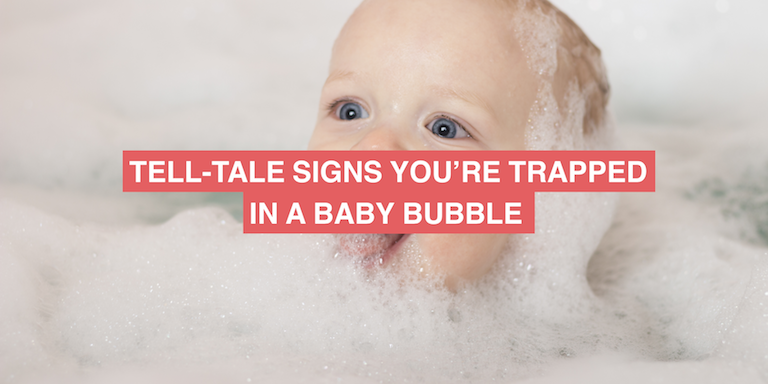 Baby bubble – moi?! You’re constantly ordering stuff online, only now it’s for the baby, not you. Your Amazon wishlist is barely recognisable to yesteryear’s thanks to all the colic-free bottles, waterproof mattress covers, plastic snot-suckers and breastmilk collection shells (yes there really are such things). It’s not glamorous, but if someone tells you it works, you’ve got to have it. Panic not, I don’t mean the baby should be talking yet – Tiger mums stand down! By new lingo I mean all the words, abbreviations and acronyms that you had no idea even existed six months ago. Thanks to texting, apps and internet forums you’ve quickly become fluent in this whole new language. But don’t worry if you still don’t know your BF* from your BLW*, or your JoJo from your Joules, the chances are you’re a much more interesting date than I currently am (*Breastfeeding *Baby Lead Weaning). It’s hard not to be obsessed with what comes out of your baby’s bottom when you spend what feels like your entire life dealing with it. The texture, colour, smell and even frequency, are all on the agenda on a daily basis. As for changing a nappy on your kitchen island – you don’t even bat an eyelid! It’s only when you experience sleep deprivation on a nightly basis that you realise how utterly exhausting it really is. So it’s no wonder that you would literally give your right arm to get one night of uninterrupted, unadulterated, blissful sleep. ‘Nap when the baby naps’ everyone tells you. If you’ve tried that too you’ll know how frustrating it can be when you’re trying so hard to sleep that you can’t. And by the time the baby does sleep through, it’s your body clock that wakes you up at the crack of dawn while they’re sleeping soundly. Not the creepy-crawly kind – but the sort of bugs that are harboured in other people’s skin, stomachs, throats, ears, eyes…. (need I go on?). When a friend messages you to say she’s poorly, the first thing you do is Google to find out if her condition is contagious. You’ve constantly got a bottle of hand sanitiser in your bag, and can’t resist giving the high-chair a quick wipe-down if you pop out for lunch. Once you’ve got a baby, bugs are your enemy. Because we all know that there’s nothing like a good old sickness bug/cold/ear infection (the list is endless) to make your baby (and you) miserable.